I've created cards for years, but have recently began making invitations for weddings and other events. I enjoy working with couples and individuals to create personalized paper goods that reflect their personalities and interests. My brother and sister-in-law described their invitation as modern, geometric, and classic. Using a palette of blue and orange, we accomplished all three wishes. Molly and Ed had a very fun, unique request for their Martha's Vineyard wedding--their family depicted in sheep! Using watercolor and ink, we worked together to create a natural and fun design fit for the whole family. Emily and Everett needed labels, signs, and tags for their modern museum wedding. 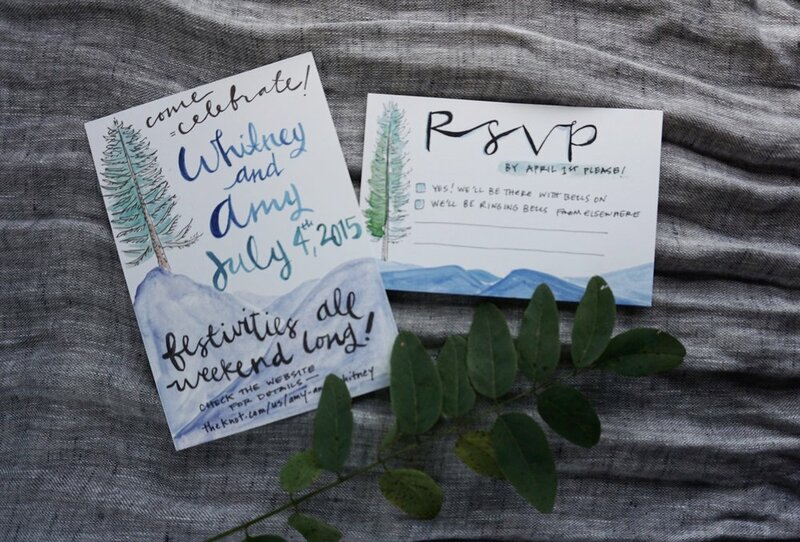 Drawing inspiration from their invitations (created by the talented Robinson Press), I used pointed pen calligraphy and brush work to craft table numbers, food labels, and signage. For a wedding on Halloween, Vera and Neil wanted... lots and lots of flowers. No ghosts and goblins allowed! Using a combination of watercolor, ink, and a dip pen, we achieved a beautiful suite that exceeded everyone's expectations. The final product hovers between formal and fun, just the way the couple wanted it. I created this menu for Vera and Neil's wedding. They LOVE food, so they wanted the menu to be showcased. Together, we created this fun and playful menu that was so fun to have on the tables! This goal for this bridal shower invitation was to be "fun, apple-heavy but not look like it's for a kid's birthday party." Watercolor apples and hand-lettering get the job done! It's double-sided, too! Whitney and Amy wanted a fun wedding invitation, map and RSVP card to go out to friends and family for their July wedding. We worked together using inspiration from the mountains to craft a unique, colorful set of pieces. I used watercolor calligraphy for the lettering and gouache to paint the mountains.